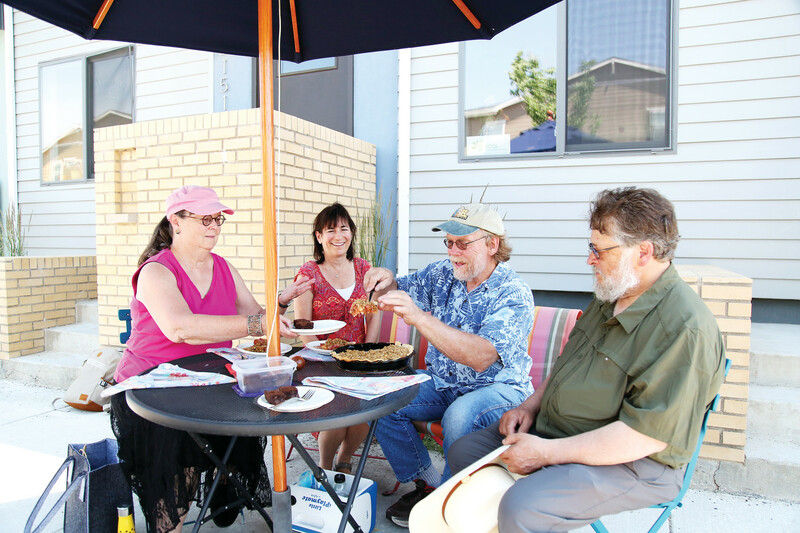 Founding members of the Ralston Creek Cohousing gather for pie in the Geos development. Community is a big part of the cohousing lifestyle. 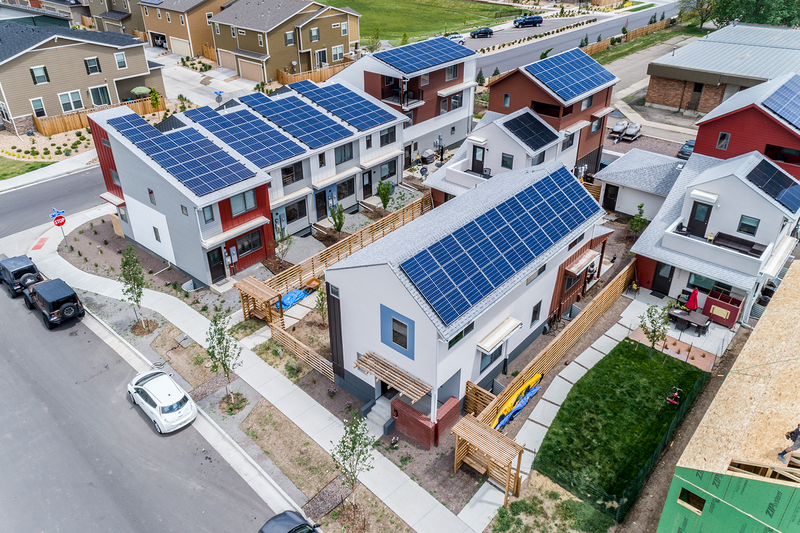 Learn more – Ralston Creek Cohousing will present an informational slide show 11 a.m. to 1 p.m. Saturday, July 14, at the Arvada Library, 7525 W 57th Ave., Arvada. The slideshow will be followed by a tour the neighborhood. All are welcome. Along the Ralston Creek Trail, west of Old Town Arvada, a new neighborhood is emerging. The modern village is powered by solar and ground source energy. Within this development of town homes, row houses and single-family dwellings, an energetic group of families is coming together to live in a condominium building with private and shared space. The Ralston Creek Cohousing is in its infant stage. But the seven households that have committed to this style of living are looking for more like-minded families to bring this project to the next phase. Cohousing is a group of households who come together because they want to know and collaborate with their neighbors. 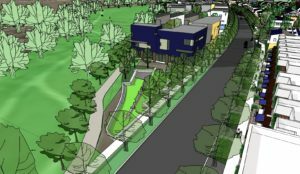 When it comes to Ralston Creek in particular, picture a three-story building called The Gatehouse with 20 private units of various sizes, parking underground, and a common house on the first floor. The common house provides a professional kitchen, multi-purpose space for dining, meeting, projects, and socializing. Two guest bedrooms and bike storage complete this shared area. An outdoor courtyard, community garden, electric car share, and dog friendly exercise area allow residents to downsize without sacrificing amenities they enjoyed previously. Downsizing is one of the draws of cohousing, Kneale said. But community is the biggest. That is reflected in the layout of the building, the shared meals and amenities and the mindset for the individuals. Burg was drawn to the cohousing model after seeing the community at the Montessori school his son attended. “Without some kind of focus or sense of common purpose, you live as strangers in the neighborhood,” Burg said. For Kneale, the Quaker lifestyle led her to cohousing. Though she was not brought up Quaker, the values stuck with her. While searching for community in Colorado, she became a member of the Boulder Arts and Crafts Co-op. The co-op is where Bob Jorgensen, another founding member, found community. “It’s people who care about the same thing I do — we bond together,” Jorgensen said. That is something he hopes to replicate at the cohousing with the multi-generational community. Current committed households range in age from 31 to 79. The Colorado Front Range has 15 cohousing communities, some dating back 40 years and some still in the forming stage. Harmony Village, established in Golden in 1996, is the only other cohousing in Jefferson County. What makes Ralston Creek Cohousing unique is its commitment to sustainability coupled with the technology to actually achieve net zero or better. 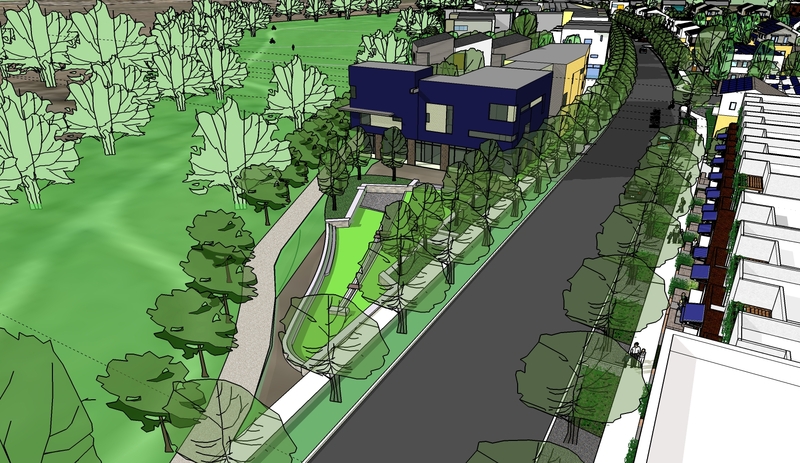 The Ralston Creek Cohousing is part of a larger zero energy development called Geos. Geos was approved by Arvada City Council 10 years ago and stared construction on its first eight homes in 2015. The development is currently building 12 homes slated to be completed this fall. Included in the original plans for Geos was a cohousing community. As The Gatehouse plan moves forward the cohousers, the developer, and Geos neighbors are already working together to provide land for a CSA (community supported agriculture), while goats are actively clearing weeds and fertilizing undeveloped land.